A young man who made an indelible mark on the world of business also came to Spring Valley about the same time the Wilders' arrived. Richard Warren Sears was born in Stewartville, MN in 1863 to James and Eliza Sears. The Sears family moved to Spring Valley in 1872 where J.W. Sears served as a city councilman, and continued his wagon shop business until 1875 when it sold to C.F. Kumm. In the fall of 1875, M.F. Varney, principal of the school grammar department, reported fall term students who stood 99 in a scale of 100, and his list included Richard Sears. We know from the writings of Laura Ingalls Wilder that her husband, Almanzo Wilder, was a boyhood chum of Richard Sears. The city's centennial history includes a short biographical sketch of Richard Sears which claims James Sears lost his fortune ($15,000) in a stock venture, and died in 1879, leaving his wife and three children penniless. Richard, at age 16, took up the trade of telegrapher, and in 1880 he was working for the railroad in North Branch, MN. By 1886 Sears had founded the R.W. Sears Watch Company, and the next year he moved the firm to Chicago. 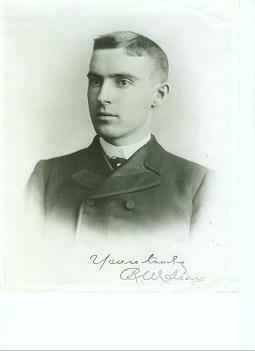 Alvah Roebuck joined the firm in 1893. Richard sears "wrote the book" on selling merchandise via mail order catalog. His "Wish Books" were placed in the hands of eager consumers, and in 1906 a mail order plant was built in Chicago, the largest business building in the world. An aggressive merchandiser, Sears, at age 45, found his health failing, probably due to overwork. He retired from the business in 1908, and died at 51, in 1914, leaving an estate of $25 million. In 1925 the company opened its first Sears Store, and today the Sears name is known throughout the world, not only for its mail order business and stores, but for diversified investments. Other Spring Valley boys who achieved success were Fred and Kerry Conley, also boyhood friends of Sears. The Conleys built a camera factory in Spring Valley in 1899, later moving it to Rochester, MN. They were business associates of Richard Sears who sold their cameras thru his mail order catalogs.